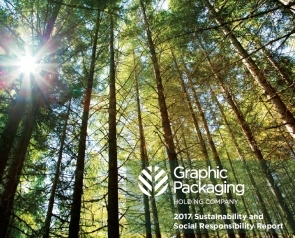 The 2017 Sustainability and Social Responsibility Report provides an extensive overview of Graphic Packaging's activities with references to the Global Reporting Initiative (GRI) Sustainability Reporting Standards. Sept. 4, 2018 (Press Release) - Graphic Packaging Holding Company (NYSE: GPK), (the "Company"), a leading provider of packaging solutions to food, beverage, foodservice, and other consumer products companies, today released its 2017 Sustainability and Social Responsibility Report. The report highlights the robust initiatives the Company has implemented and is continually pursuing to preserve the environment and invest in the communities where it operates. The report is available on the Sustainability tab at www.graphicpkg.com. "We are proud to formally present our 2017 Sustainability and Social Responsibility Report, which clearly lays out the strides Graphic Packaging has made on key sustainability and social initiatives and what we will continue to focus on for many years into the future," said President and CEO Michael Doss. "Sustainability and social responsibility are at the heart of what we do at Graphic Packaging. This includes the renewable and recyclable paperboard-based cartons and foodservice containers we produce for our customers from renewable wood fiber, our focus on continually reducing our raw material consumption and environmental footprint, and our significant involvement in the communities where we operate. We look forward to keeping our stakeholders updated on our continued progress on these initiatives in the future."